When a person’s thoughts start to stray, they can tend to go in one of two directions. Sometimes people find themselves dreaming of an upcoming vacation or looking forward to a get-together with friends . . .
. . . or, maybe they’re distracted by worries about approaching deadlines or unpaid bills. Even though the former scenario seems preferable to the latter, both instances of mind-wandering could be detrimental to happiness. Why? Dan Siegel, MD reveals his answer in the video below, and shares one way to refocus. How have you used mindfulness practices in your work with clients? Please leave a comment below. I always work from the “NOW”, from the present moment. Often clients realize that the problem is just a thought and not what presents itself in the moment, and that they can change thoughts and patterns :). I am not a practitioner but other words I use for mind wandering are distracted or even mind f**cking. Distracted when that is basically what I or others are and the second term when I can’t get something out of my head. A friend taught me a great technic to get present in those moments. Put an elastic band around your wrist and every time you catch yourself wandering flick the elastic band. It brings you back to the present and after sometime train# your mind not to wander off on its own. yes I use mindfulness to focus the client’s awareness to their internal body processes and responses so they have more information about themselves and to expand their resources. I use Mindfulness InnerRepatterning with clients and myself when necessary. It facilitates the process of moving from being immersed in and taken over by negative inner talk, images and feelings, to putting these (in imagination) physically outside where they can be observed with open accepting awareness. These sequences of negative thoughts are attended to quite briefly to avoid returning to the understanding/explaining mode of cognitive awareness, so that inner sensing of what comes up can be attended to and allowed. Clients get into trouble with negative thoughts when they are immersed in them and they become their reality, or when they try to get rid of them by distraction or force. When they move through the Mindfulness InnerRepatterning process the thoughts can release in the light of open, accepting awareness. This technique is the brainchild of Tania Prince and June Spencer. On the subject of meditation, I have meditated for many years and find that in the past I have always come back to trying to get rid of thoughts or trying not to try to get rid of them. I find that when I allow them, they can effortlessly slip into peripheral awareness, leaving my focus of awareness on my object of meditation, and so those thoughts naturally fade without forcing. I have used mindfulness but Dr. Siegel’s explanation of the difference in mind wandering and, as he called it, “mind freeing” is a concept I had not encountered before. His presentation of the results of both negative and positive mind wandering being alike was new to me. Thanks for sharing this information. Thanks Dan. Love your work. Mindfulness has been an immense part of my practice. I use noticing breath briefly as a 1st step toward what is actually mindful awareness. I have found that patients move into mindful awareness when they start noticing and pausing with uncomfortable feelings, sensations, thoughts, and images, and also noticing and pausing with automatic responses to escape or change them, with a sense of allowing awareness. I see the deepest shifts when in the moment of being aware and allowing, verses resisting, patients move from being identified with or absorbed in the resistance of the discomfort in these experiences to holding them in this sense of allowing awareness as these experiences blossom and dissipate. This open receptivity, allowing, and ultimately a resting in this awareness has been very transformative for many of my patients. I use focussing on breath, short meditations, mindful walking and exploring activities that the student enjoys where they can recognise themselves being mindful. I work at a high school with Senior Students and all of the above practises allow the student to call upon strategies that may help them in different situations. (I also encourage students to have time for ‘mind freeing’). I find that most students respond positively to mindfulness exercises and like to try ‘a few on. I use mindfulness in my Equine Facilitated Therapy practice with all my clients for a variety of reasons. In the treatment of trauma, mindfulness helps to keep the person in the present as they process traumatic experience of the past. In ADHD, ASD and the like it is useful for self-regulation. And the horses are amazing co-therapists as they assist the client to be calm and present by their gentle yet large presence. Mindfulness interventions have been extremely helpful in dealing with clients who suffer from anxiety and compulsive thoughts. G’day! It is exactly the answer I got right from a good friend of mine. The focus is on the breath and the fact that you are here! Just this morning, I brought up the complexity of being multi-task at work and staying mindful. I couldn’t pick up everything after the stormy productive day. So, my retreat revealed to be very helpful. Yoga is something else that isn’t on my list for a good reason. Not much time in a day to fit in. I use Awareness of Breathing with my students before testing. They are finding out that it will calm their test anxiety. Also, using yoga as a way to calm students. This is elementary level. They love it! I use mindfulness in practice to stay with the client, to bring them into a connection with the here and now, what is present for them. This examples something of staying with the moment and building their and my awareness of the present. I like then way that the clip above extracts mind wandering and mind freeing creative practice. It is a simple manner in which to clarify the difference. On the other side of side of the coin, I often feel like my client can shows some apprehension about how I may have in my morning mind some kind of an agenda and a sort of mixed purpose when helping. The session would reveal to be very focused on whether which of the direction the session may takes us. My being absorbed in what I have my my mind can takes me away from hearing all what my client is saying which may cause some misunderstanding about how more successful our session can be. It is like doing meditative contemplation in a conference room while thinking, taking notes and learning to listen and quietly asking to myself what kind of questions am I going to ask. I just sit still and look for more answers in a room that is becoming empty & cold . Is that due to my dissociation or sort of like it? How can I stay present during my duties ? I use mindfulness in a creative way with children by incorporating art in play therapy. The children get lost in the process of drawing a ‘ happy moment ‘ in their lives or making a memory bracelet. I find that utilizing breathing techniques with the children helps to calm them and get them grounded and focused. Greatly appreciated. Thank you for the clarifications, Dr. Siegel D.
I teach about mindfulness, incorporate a mindfulness exercise, early in the therapeutic relationship. Many find it helpful. As a counselor in BC Canada, (originally I am from Hungary) I experience every day this phenomenon, when coming in my office, my clients are not able to stop their wandering mind and feel unhappy and when they start to practice Mindfulness, I can witness in time, how this practice and being able to be more present changes their quality of lives. Thanks for the encouragement Dr. Siegel and Dr. Ruth Buczynski! I try to use mindfulness with clients, promoting presence as well as deliberation of thought(s). I am interested in exploring the difference between presence and mindfulness. Thank You Dan for your words of wisdom. And to clarify between “reveries”, vs. negative / positive thoughts that may be leading to depression. I love how you try to present the “idea” in a considerable brief but clear way. Being aware of their clothing, affect, body movements, hygiene, and posture. I then imagined myself in their place and when I did it successfully, was able to see their limiting beliefs and suggest effective solutions. Would you be available to discuss this for an hour on my international health radio show? It’s a great subject for my Veteran’s with PTSD and TBI. People like Eckhart Tolle have been teaching this for years and drawing on this idea from centuries back. As a trauma victim who is studying trauma’s impact on the mind and body I find that Mindfulness meditation serves the very important function of helping the trauma victim not only calm the limbic alarm system but to also notice safety in their environment. Living in chronic safety enables us to escape the grip of sympathetic nervous system activation that debilitates and constricts our lives, but we have to be able to notice that safety in order to live in it. Many people address this with grounding and centering exercises, but it really needs to be trained into one’s lifestyle along with body work, cognitive processing, and healthy nutrition, hydration, and oxygenation strategies. Restoring to a parasympathetic state and staying there as much as possible is a pre-requisite for healing and recovery. Mindfulness is a great tool for promoting a restorative relaxation state and mitigating distress. Learning to relax and meet our homeostatic needs again in healthy ways can be very helpful in enabling us to emerge from trauma’s shadow. Thank you for this. It creates great clarity about what presence is. Being mindful and present is how I intend to be when I work with clients. This creates a space of greater possibility of attunement. And with Sensorimotor Psychotherapy, I hope to help clients learn to be more mindful and present. just realised so called positive day dreaming can lead to unhappiness too. I use MBSR and MBCT in my practice and find that clients respond incredibly well to learning how and why it works (a bit of neuro psychology education, pitched to their presenting problem) before we commence. I am so grateful to the work of Dr Dan Siegel, Jon Kabat-Zinn and others, for deepening my own knowledge so I can pass this on in a therapy setting. I work with children in the school setting. While playing board games, or doing a project I like to initiate a “stop and notice” moment. ie: Hey team, isn’t this fun just playing this game together right now, even when X had to go clear back to start, and Y consoled him. Wasn’t that a cool moment?” Then kids share very candidly. Please be in touch with me. I have been doing workshops on Mindfulness for 40 years. I think everything I do in my practice is actually mindfulness. Be it bodywork, be it grounding techniques, stress reduction or emotional release, all these are mindfulness in essence. The client slowly learns how to deal with the deeper lying fears and layers of emotions, painful memories and unconscious patterns, automatic reactions and even physical pain through awareness. But not only awareness of what it is, but also about how much they are ready to take, how much they can cope with, what they need to be able to admit more and more, where to stop and where to go…. 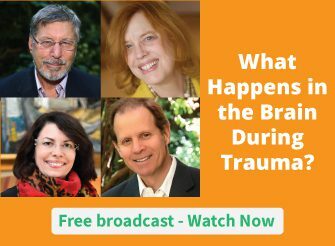 I really am grateful for your help and wonderful information through the many courses and also the little videos and infographics on subjects like trauma, stress and the brain. Your work has been and still is a great support for my practice, I’m looking forward to future participations. I love and admire all the work you have done with mindfulness, and your teaching mindfulness. As a retired psychiatrist, now life coach, mindfulness has been a foundation of my work over the last thirty years! Thank you so much for making the world a better place! I formerly taught Vipassana, Metta and other practices for years in individual and group retreat settings. I also recommended, when appropriate, that clients might use the meditation Cd’s I made years ago (now conveniently available on iTunes or my website). The training they obtained was reported to be invaluable for alleviating and in some cases overcoming mild depressions and anxiety as well as certain phobias. Many thanks to you Ruth for your excellent site and fine work in disseminating this vital information. Normally I use mindfulness just as a way of supporting people to get beyond the talking, and in a open way supporting to feel whatever might be avoided in a way to help them change their relationship to an experience which might be stopping them from achieving what they want to achieve. There are so many ramifications, however what Dan is talking about is very useful as a way of distinguishing the kind of unintentional wondering which might be more problematic to the wonderful intentional wondering which might confirm well-being. the teachings and might there be a danger for us to focus on techniques as opposed to a more integrated understanding. My other concern is how these approaches are available to people living on the margins of our communities. Additionally, and more recently I ‘ve added a gentle-touch technique that begins to awaken the body and brain via the connective tissue. Gradually, in a relatively short period of time, energy surges to the prefrontal cortex where greater compassion, insight, joy, and clarity are accessed – by its very nature – leading to greater and greater Presence. The results are nothing short of catapulting one out of fear-based behavior and thoughts into a state of consciousness generating evolution (individually and beyond). Thank you ruth and Bernie so much for this little video. Vital to our evolution. So spontaneous positive thoughts are bad for us!? What nonsense! This sort of stuff undermines my faith in ‘mindfulness’, which sounds more like ‘mindlessness’ in the form pushed here. Dr. Siegel is teaching us to fear our minds, our daydreams, and our very selves. Spontaneous positive thoughts and feelings are gifts from God for which I am grateful. I, too, would appreciate some elaboration on why wandering positive thoughts are bad. I am a bit confused on that part. if i may clarify: positive or negative wandering thoughts are not bad. thoughts are not bad … thoughts are the most natural process of being alive. if one were to study mindfulness more deeply, though, one would find that what is being sensitized is the awareness of clinging to or pushing away thoughts – and the emotions and beliefs that come in tow – for it is through the grasping and clinging of any thought/emotion/belief that suffering is cultivated. we suffer because we want to hold onto positive/pleasurable experiences or because we push painful ones away. mindfulness builds the resilience for allowing us to ‘be’ in emotion – to claim it’s gift – and allows us to trust letting it go to open to the infinite divine possibility of every moment. being alive is the experience of these spontaneous thoughts and feelings and gifts ‘from god’ and being mindful allows us to be present in order to hold and cultivate those gifts in ways that support our lives and in ways that are helpful to humanity. my personal definition of mindfulness is that it is a process/practice that helps us navigate life and helps us be present for what is called ‘god’, isnness, nowness, consciousness, presence etc. i hope that was helpful. Interestingly, I am not sure I completely grasp the point …but it is surely something to ponder…Thank you for resolving a part of my curiosity though. I want to pick up on the first part of the clip where Dan talks about ‘mind-freeing.’ I think this is related to dreaming and creative imagination (and incidentally, a state I encourage in clients in session as a way to open up somatic memory and embodied intelligence). I wonder about the evidence behind this statement — how is mind-freeing difference from wandering and what are its effects? Dan implies they are beneficial — and I suspect have positive effects that differ from those or presence and mindfulness. As an artist and right-brained person, i totally understand . . . . From my work with the brain – creating new neural pathways to the PFC (prefrontal cortex) – I have seen significant differences in people who are willing and able to focus on the here and now, (not go into the story of the past trauma, drama, safety net) and allow the present to BE, to flow through their bodies during a session, and not resist. I’d say Intention plays a major role here – ie: in video Siegal discriminates btw mind-wandering and a person who intentionally goes to the ‘beach’ to relax This could also be an artist intentionally creating from an open mind in the studio. Thanks for the feedback. Yes I did appreciate that Dan Siegel differentiates intentional creative imagination from mind-wandering that merely distracts from the present moment. I wanted to raise this point because I was concerned it would get lost. Also, I am very curious about how intentional vs. unintentional mind wandering affects people differently — ie how this is measured, how Dan knows one is good and the other is not. Personally, my greatest insights have come when I am out for a walk or run and simply allow my mind to flow freely. I am the client. My therapist got me into meditation. It/ and she, taught me at first that I can Change my my wandering, which was the precursor to being more present. Once I could get off bad thoughts into “better” thoughts, I could then introduce – being more present. Yes, very cool! So glad you got into meditation and that it has helped you! It is powerful to know you have the ability to change or redirect your thoughts. I’m wondering if the “mind wandering” that Dr. Siegal refers to is a form of dissociation. And as we know from trauma therapy research, dissociation is a major factor in a client being unable to process and integrate a traumatic experience. So maybe we don’t just need to stay present to process traumatic events but everyday events too in order to stay psychologically healthy? Thank you for this interesting and thought provoking clip. As a client, I say a resounding ‘yes’ to your question! I now recognize the value of being present, and I have the skills to pull myself out of both obsessive thinking (anxiety) and dissociative feelings, which actually, I don’t think I have any problem with anymore (dissociative). That doesn’t mean that I’m willing to “coast” or “wander!” Not by a long shot, and yet, I’ve come so far. I do like to take a break, i.e., mindless activity… still. But not without an inner awareness of Reality. She taught – and still teaches – me to be aware, how to be aware. My life – my self – has changed immeasurably. Thank god for gifted therapists who are so dedicated and patient, and willing to learn as well! We use Five point ear acupuncture with mindfulness. We find the ear acupuncture helps to speed up healing. Also use Bio-feedback. The results are nothing but amazing. My job is so rewarding, I see clients healing right in front of my eyes in a short period of time using acupuncture/mindfulness. Thank you NICABM for all the information you have shared. Thanks. A useful distinction between presence and mindfulness. I am a regular person suffering greatly with mind-wandering. I take ADHD to try to help, but it isn’t the answer because it isn’t effective. I try practicing mindfulness and it is very challenging to do more than 5 minutes. To be in a true state of mindfulness is very very very challenging. Because it is so hard for me, I experience more anxiety, stress, depression,.. I could sleep my life away. I still practice even if it’s only 5 minutes. I try it several times a day. Yes, mindfulness is hard! It is great that you are trying it as much as you are and that you are committed to practicing it every day, and even multiple times a day. Maybe with time you will be able to do it for longer. Something that has also helped me is trying to be more mindful during times I’m not actually mediating. When I’m walking around outside I might notice the color of the sky, the wind, the people around me, the air temperature, my place in relation to the buildings. If I’m washing my hands, I’ll notice the liquid-y-ness of the water and the temperature. If I’m talking to someone, every now and then I’ll remind myself to be mindful, and then I’ll try to really hear what they’re saying, how I’m reacting in my body, and what their facial expressions are telling me. Maybe trying to be mindful more in everyday life could help you, too? Also, you thoughts are always going to wander; being mindful does not mean stopping the wandering completely, just taking note of it and bringing your focus back to the present. There’s no need to beat yourself up for not doing it “right.” And if it’s causing you more harm than benefit, maybe consider taking a break from it. yes i did this experiment at uni. mind wandering and happiness. it is true presence is effective and better way to stay focused. Sounds familiar to what I have known as well. My students in Middleschool are Daydreamers. This could take people to place into the future. But well back in the time and focus to the present could be hard. Yes, we use mindfulness practice and strategies with our Anger Management programs to assist clients to refocus, calm their emotions and thoughts, and in this process change responses to actions. Thank you for the report and video as I am always open to new ideas and learning. Very much appreciated. I use mindfulness with my clients regularly. One example of this is that I try to teach clients struggling with anxiety to learn and practice the habit of being more aware of their thoughts. This serves as a stepping atone to the work of replacing unhelpful (escalating) thoughts with more calming and more rational thinking. I also utilize mindfulness with anxious clients to help them become more attuned to their own physiology vis-a-vi anxiousness/nervous system arousal. Then, of course, the use of the breath is a prominemt fixture within the work of teaching self-regulation.